Integration of design templates with Drupal Commerce. Integration of website with Eden’s CRM, Accounts and Fulfilment systems. We are pleased to be working with Donald. He is a dependable, talented designer with the kind of in-depth technical knowledge and experience we require. Eden Project is an ‘Eco park’ and visitor attraction housed under artificial ‘biomes’ in Cornwall. Asked by Eden to redesign and build a new e-commerce website. Eden had an existing site that was functioning but dated in look and feel, ‘off-brand’ and difficult to use on tablet and mobile platforms. 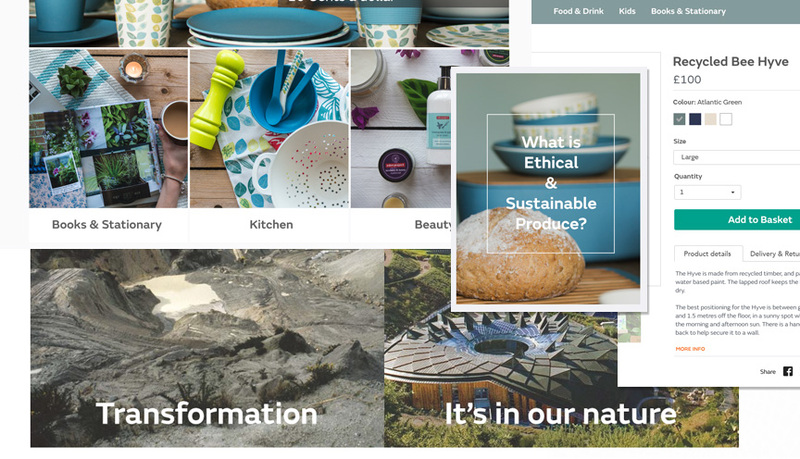 The re-design needed to provide a cleanly designed, responsive and easy to maintain e-commerce solution that reflected and re-enforced the company’s strong Cornish and International identity, it’s ‘eco-friendly’ products and branding, ethos and charitable status. 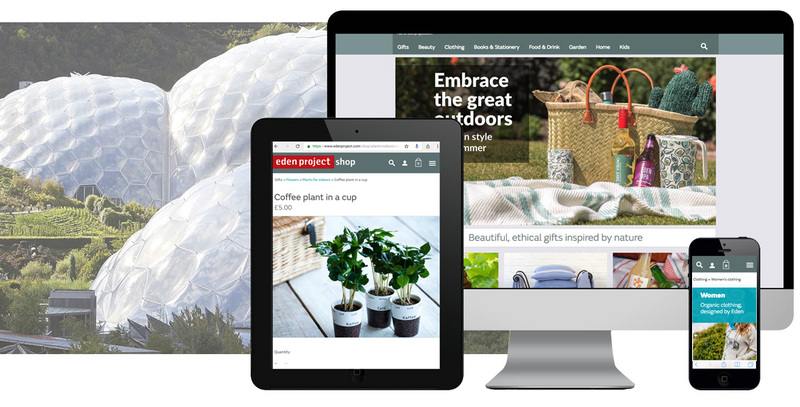 After a review of the existing e-commerce site and it’s integration with Eden’s back-end IT systems ‘Drupal’ (open source CMS) was chosen as the new e-commerce platform to allow for closer integration with Eden’s existing online platforms and CRM databases. Working within a short timeframe for the site’s complete delivery, user research began with a number of individual Stakeholder interviews at Eden Project followed by a design workshop with members of the ‘Content’ and ‘Buying’ Teams to define and discuss on-line competitors and their websites including elements of good and bad design patterns, user flows, navigation, customer archetypes and branding. An analysis of the existing website’s analytics over the last three years was carried out to validate elements of the business requirements discussed in stakeholder interviews and ‘surface’ trends in visitor traffic and demographics over the period. After a review of Eden’s existing visitor research, user interviews were held and recruited from two pools – those that had visited Eden and those that had not. Visitors were interviewed in Cornwall while non visitors interviewed in Brighton. Interviews were based around Competitive Usability testing where users completed a set of tasks using 2 or 3 sites from recognised competitors to give an understanding of what did and didn’t work from a user’s perspective. Areas tested or discussed ranged from user goals and brand expectations to user flows, navigation, content style and tone. 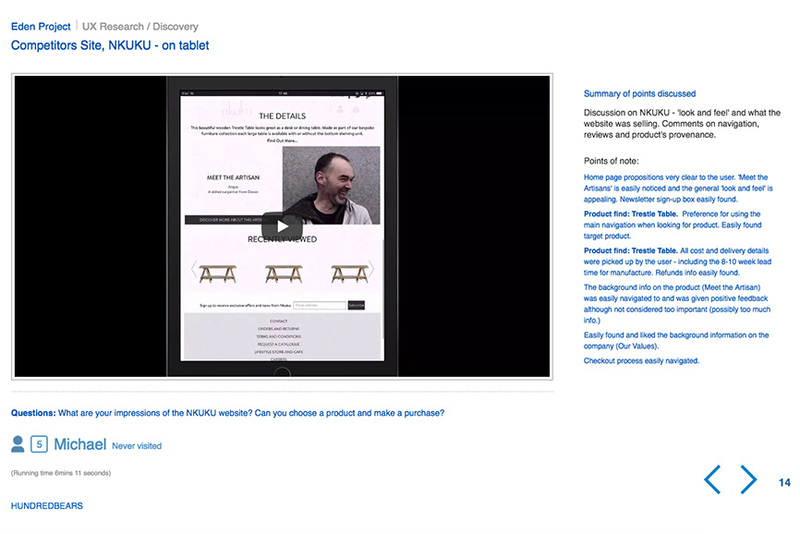 An online ‘summary of findings’ report was produced (text, audio and screen capture video) and presented back to Eden, highlighting consistencies in interactive behaviours as well as wider patterns based on user perception of branding and charities (in particular with Eden as a visitor / non visitor), product provenance and product cost thresholds. 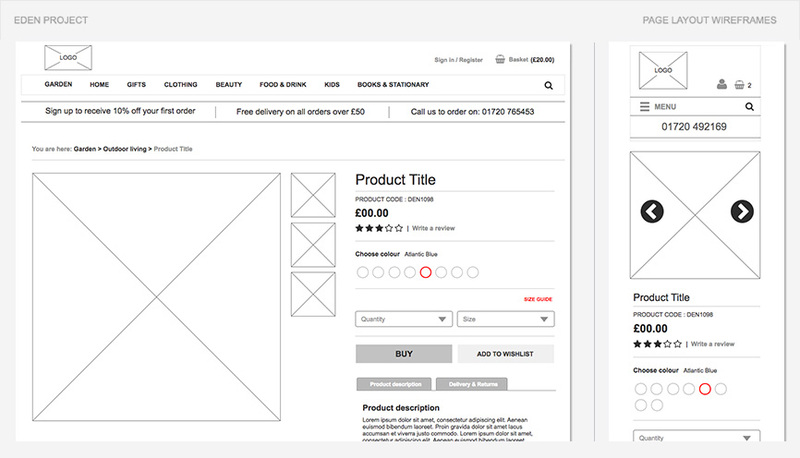 A series of low fidelity interactive wireframes were produced in Axure to determine navigation and content structures followed by full high fidelity mock-ups of key pages in their responsive states. After a number of design iterations all key templates were coded in HTML/SASS using the Bootstrap framework and integrated with the Drupal/Commerce system. The new site was finally linked into Eden’s CRM, Accounts reporting and Fulfilment systems. A fast, fully responsive, WCAG 2.0 (AA) accessible website. A stronger, more consistent branding experience based on research led design.